1. Dr. Abhisekh Sinha Ray, M.D. A 37 y/o male patient with h/o hypertension, chronic smoking, cannabinoids abuse and schizoaffective disorder presented with atypical chest pain. 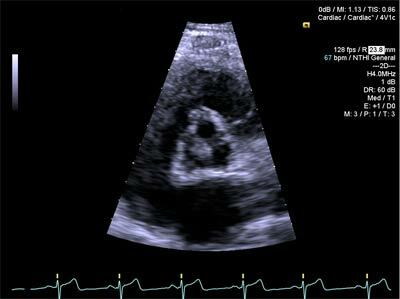 On echocardiography- an aortic valve mass was detected. Out-patient TEE was planned but patient was lost to follow-up. After 7months, while he was admitted to psychiatry in-patient unit, repeat TTE was done- which confirmed the persistence of the mass. TEE was done which showed 1.2×0.8cm pedunculated mobile mass attached to the non-coronary cusp of aortic valve, which had a homogeneous echotexture with “speckled appearance”. The lesion was suspected to be papillary fibroelastoma and patient was referred to cardiothoracic surgeon for excision of the tumor for its size and pedunculated structure. Post-surgical histopathological examination confirmed the diagnosis of papillary fibroelastoma. A 37-year-old male was admitted to the hospital with the c/o right sided chest pain of 1 day duration. The patient was a chronic smoker and had h/o hypertension (on therapeutic lifestyle changes). He presented to Emergency Department of an inner-city hospital with a complaint of chest pain located in his right anterior chest area, non-radiating, tingling in nature, episodic lasting for about 15-20 minutes, 7/10 on intensity. He has had about 5 episodes in last 24hours. He claimed that that the pain started while repairing a vehicle at his auto-shop. He denied any SOB, palpitation, leg swelling, nausea, vomiting. Patient didn’t experience any dizziness, loss of consciousness, any weakness of the extremities, visual blurriness or speech difficulty. No c/o cough, hemoptysis, fever, chills, myalgia, loss of appetite or weight loss. No h/o recent long travel or sick contacts. Patent was allergic to Penicillin. He was not on any regular medication at home. He lived with his sister. His father had hypertension and died of stroke at age 45. He used to smoke 4-5 cigarettes daily for last 2years and take marijuana occasionally but denied any intravenous drug or alcohol abuse. He also carried a diagnosis of schizoaffective disorder. On initial evaluation, patient was found to be in no apparent distress. Pain scale: 0/10 (none at the time of examination). His vitals were blood pressure: 148/94 mm of Hg, temperature: 98.9oF, pulse: 95 beats per minute, saturation: 100% on room air. His physical examination was completely unremarkable. The hematocrit was 40.0% and the remained of the complete blood count was normal. The blood urea nitrogen level was 13mg/ deciliter and creatinine was 1.1mg/deciliter. Levels of other electrolytes and liver function were normal. Total creatine kinase (CK) level was 660 IU/L, CKMB relative index was 1.2 and Troponin I (cTnI) was <0.05ng/ml. Serum amylase level was 120U/L and Lipase level was 33U/L. Coagulation profile was normal. Urinalysis showed pH of 6.5 and specific gravity of 1.010. The urine was negative for blood, protein, glucose, ketones, nitrate and esterase. Urine toxicology was only positive for cannabinoids. A radiograph of chest demonstrated intact bony thorax, no cardiomegaly, no acute pleural or parenchymal disease and hilar vessels were unremarkable. An electrocardiogram done on admission revealed, sinus rhythm with a ventricular rate of 71 beats per minute with early repolarization changes & QTc was 419 milliseconds. Patient received Aspirin in Emergency Department and was started on gentle IV hydration. Plan to admit the patient in medical floor to rule out Acute Coronary Syndrome with serial cardiac enzymes & EKG, to obtain an echocardiogram and to monitor blood pressure. Patient remained clinically stable & asymptomatic on medical floor. 3sets of cardiac enzymes done at regular interval over next 24 hours were found to be negative and serial electrocardiograms didn’t reveal any dynamic ST-T changes. Serum creatine kinase level came back to normal. Trans-thoracic echocardiography revealed the left ventricular walls were in normal in thickness with normal segmental contractility. Global left ventricular function was normal – visually estimated left ventricular ejection fraction (LVEF) was 65-70%. A mobile mass measuring 1cm by 1cm attached to the non-coronary cusp, at times prolapsing in to the left ventricular outflow tract (LVOT) is noted without any associated aortic regurgitation (Figure: 1&2). Echocardiography with spectral Doppler showed normal velocities. Patient was evaluated by the cardiology team. In view of lack of fever, normal leukocyte count, normal ESR (ESR of 3 mm/hour on 2nd day of admission), absence of clinical features suggestive of septic or immunologic phenomenon, no h/o intravenous drug abuse or precipitating event possibility of infective endocarditis was not entertained. The aortic valve mass was thought to be either a benign cardiac tumor or thickening of the valve cusp. Trans-esophageal echocardiography was planned as out-patient for further assessment and patient was discharged with follow –up appointment in a week in cardiology clinic. Patient was lost to follow-up subsequently. Approximately 7months later, patient was admitted to psychiatry unit with auditory hallucination and paranoia. Patient was reevaluated by cardiology. Had no active medical complaint. 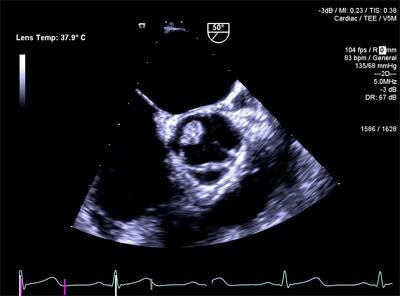 Repeat trans-thoracic echocardiography was done which showed a mobile pedunculated mass measuring 1.2cm by 1.1cm attached to aortic valve cusp. Color-doppler flow didn’t reveal any associated aortic regurgitation. Left ventricular systolic function was normal. Patient was then scheduled for trans-esophageal echocardiography which revealed a highly mobile 1.2 cm by 0.8cm well demarcated oval mass attached to the non-coronary cusp of the aortic valve with a thin stalk. The mass was homogeneous and “speckled” in appearance with “stippled edges” (Figure: 3, 4 &5). 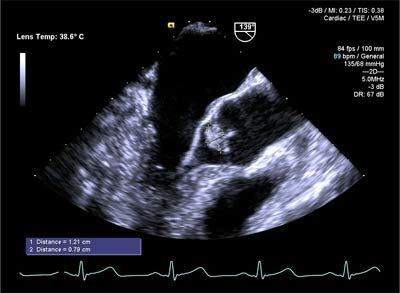 In view of present clinical scenario, a young male presenting with atypical chest pain, was found to have an aortic valve mass on echocardiography, following differentials were considered:- Intra-cardiac thrombus, Infective endocarditis, Non-bacterial thrombotic endocarditis and Cardiac tumors. Classic manifestations of native valve infective endocarditis are fever, leukocytosis, bacteremia with typical organism (e.g. Streptococcus viridians, Staphylococcus aureus) and new or changing regurgitant murmurs. Inflammatory markers like ESR and C–Reactive Protein level tends to be typically high. Right sided infective endocarditis is also a common feature in intravenous drug abusers. Patients with previously damaged heart valve tend to develop infective endocarditis after an episode of transient bacteremia. However, the patient in our discussion never had fever; white blood cell count was normal as was the ESR, no cardiac murmur was identified on physical examination. Echocardiography did not reveal any damaged valve or any regurgitant lesion. He also didn’t have any feature of septic embolization or immunologic phenomenon like Janeway’s lesion, Splinter hemorrhages, Roth’s spot or Osler’s node. So infective endocarditis was unlikely. Non-Bacterial Thrombotic Endocarditis (NBTE) is also another possibility. NBTE is associated with mucin producing adenocarcinoma (e.g. pancreas, lung, colon, prostate), Systemic Lupus Erythematosus and hypercoagulable state (Anti Phospholipid Antibody Syndrome), DIC, uremia and burn. Left sided valves are more commonly involved, specifically along the lines of valve closure, resulting in progressive destruction of the valve tissue. These lesions are typically fibrin and platelet rich. Systemic embolization of the thrombus is the common presenting symptom. But our patient never had any precipitating condition and echocardiography also confirmed preserved valve anatomy and function. Metastatic cardiac tumors are far more common than primary cardiac tumors. Cardiac metastasis mostly affect the pericardium and myocardium; endocardial involvement is rare. Secondary cardiac tumor may arise via hematogenous route, direct invasion from the mediastinum or extension of the tumor growth from the vena cava. In case of widespread metastatic disease (except CNS neoplasms), cancers of lung, breast, esophagus, thyroid, kidney and sarcomas have a higher predilection to involve the heart. Mostly cardiac metastasis are multiple and remains asymptomatic. This patient did not have any history or clinical feature suggestive of malignancy. Among primary cardiac tumors 25% are malignant, of which sarcoma & lymphomas are noteworthy. Angiosarcoma is the most common primary malignant tumor of the heart originating from the vascular endothelium and have a higher male preponderance. These are mostly found in the right sided chambers; characteristically appear as large, highly vascular tumor on cardiac MRI. Primary cardiac lymphomas are Non-Hodgkin lymphoma, can be either B or T cell in origin. This type of tumor is very rare and mostly associated with AIDS, transplantation or immunosuppression. Most of the primary cardiac tumors are benign. Myxoma and Fibroelastoma are the major contributors. Cardiac myxoma is most common benign tumor, arises from mesenchymal cells, accounting for approximately 30-40% of all cases. It mostly affects females in their 4th to 6th decade of life. This tumor is notorious for embolization to various organ system. Though myxoma is most commonly located in the left atrium and usually attached to the intra-atrial septum in the region of fossa ovalis but it can also be found in other cardiac chambers. Clinical features of myxoma could be either positional occurring due to obstruction of the blood flow by the tumor or due to embolization of the tumor mass to various organ system. Patient may present with dizziness, dyspnea, cough or congestive heart failure and more frequently constitutional symptoms. On echocardiography the tumor appears as ovoid or spherical mass, generally pedunculated, mostly have heterogeneous echotexture. Gadolinium enhanced MRI distinguishes thrombus from myxoma as myxoma typically gets enhanced while thrombus does not. Myxoma characteristically has a gelatinous appearance on cross section which correlates histologically with extensive myxoid stroma with sparsely distributed spindle shaped cells, both are PAS positive on histochemical staining. Myxoma can recur in about 3% of cases after surgical removal. Being the most common primary cardiac tumor, myxoma was considered in our differential diagnosis though the clinical feature and the location of the tumor in this patient were not typical of myxoma. Papillary fibroelastoma is the second most common primary cardiac tumor; unlike myxoma, it tends to occur in elderly age group (mean age at diagnosis is 60 years) and more commonly found in male. This tumor originates from valvular endocardium and aortic valve is most commonly involved. Lesions are generally single. Etiology of this tumor is debated but papillary fibroelastoma is the second most common primary cardiac tumor; unlike myxoma, it tends to occur in elderly age group (mean age at diagnosis is 60 years) and more commonly found in male. This tumor originates from valvular endocardium and aortic valve is most commonly involved. Lesions are generally single. Etiology of this tumor is debated but immunohistochemical study indicates the theory of virus induced local tissue growth along with age related valvular degeneration and microthrombi formation. Almost about 30% of patients with papillary fibroelastoma remain clinically silent. Those who become symptomatic, are mostly due to embolization of the tumor fragments or the thrombus originating from the tumor surface. Patients may present with stroke or Transient Ischemic Attack (most common), heart failure, syncope/ presyncope and sudden death. Angina or myocardial infarction may occur as a result of the coronary ostial occlusion by the tumor or embolization to the coronary artery. 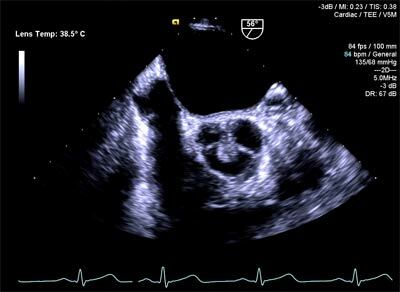 On echocardiographic imaging the tumor may vary from 2-70mm in size, usually attached to the valvular surface with a narrow thin stalk, is homogeneous in appearance with typical “speckled pattern”. Trans-esophageal echocardiography at high frequency and resolution better delineates this tumor as a highly mobile structure with characteristic “stippled edges” produced as a result of its movement in blood flow. Gross specimen shows the tumor is comparable with “sea anemones” with multiple frond like projection attached to a central core. Microscopically the frond like arms are avascular papillary folds consist of dense elastin tissue coated with loose collagen, covered with a single layer of flat endothelial cells. Surgical removal is indicated for larger (>1cm) tumor as it carries high risk of embolization & least chance of recurrence after resection. Though the patient was young, considering the classic echocardiographic findings, our primary diagnosis was Papillary Fibroelastoma. Myxoma was also into our consideration in view of the age of the patient and myxoma being the most common benign primary cardiac tumor; though the location of the mass was not usual for myxoma. Patient and his family member were explained about the diagnosis and therapeutic approach. In regards to the size of the tumor and risk of embolic phenomenon including TIA, stroke and myocardial infarction in the future, open cardiac surgery with removal of the tumor was recommended. They were also counseled regarding other alternative management plan with close clinical evaluation and frequent echocardiographic monitoring of the size of the mass/ tumor growth. As they agreed to proceed with surgical intervention, patient was referred to cardiothoracic surgeon for further management. Within a week period, patient underwent open cardiac surgery and resection of the mass with median sternotomy approach. He was placed on mechanical cardio-pulmonary bypass with appropriate flow rates and therapeutic hypothermia was instituted. At the time of induction of anesthesia, pulmonary artery pressures were 23/12mm of Hg with cardiac output of 6.2 L per minute. 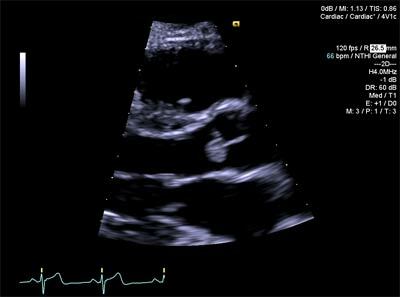 Pre-pump trans-esophageal echocardiogram showed an ejection fraction of 55%. Upon opening the chest the heart was moderately hypertrophic. An oblique aortotomy was made 1cm above the aortic root. Aortic valve was examined and the lesion was found attached to the ventricular surface of non-coronary cusp and was gently excised preserving the valve leaflets. Patient was weaned from cardio-pulmonary bypass with vasopressor and inotropic support. The mass was send for pathologic examination at two different laboratories. The post-op course was uneventful and he was discharged home on post-op day 4. A month later, patient was followed-up in the clinic. He has been recovering well. Physical examination was unremarkable. His medications include Aspirin, Metoprolol XL, Benztropine and Risperidone. He was counseled to quit smoking and cannabinoids use. 1. Giannesini C, Kubis N, N’Guyen A, et al. 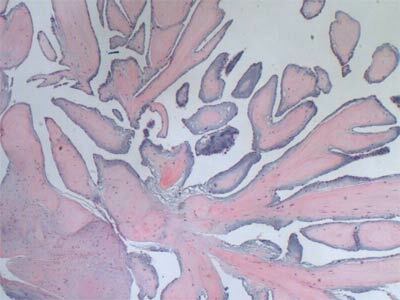 Cardiac papillary fibroelastoma: A rare cause of ischemic stroke in the young. Cerebrovasc Dis 1999; 9:45. 4. Grinda JM, Couetil JP, Chauvaud S, et al. Cardiac valve papillary fibroelastoma: surgical excision for revealed or potential embolization. J Thorac Cardiovasc Surg 1999; 117:106. 6. Gowda RM, Khan IA, Nair CK, et al. Cardiac papillary fibroelastoma: a comprehensive analysis of 725 cases. Am Heart J 2003; 146:404. 8. Elbardissi AW, Dearani JA, Daly RC, et al. Embolic potential of cardiac tumors and outcome after resection: a case-control study. Stroke 2009; 40:156. 9. Ni Y, von Segesser LK, Dirsch O, et al. 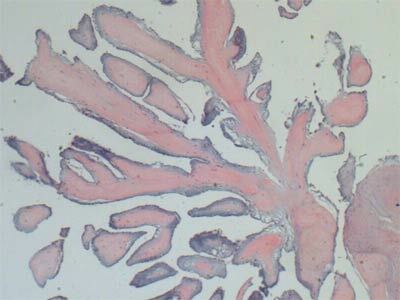 Cardiac papillary fibroelastoma. Thorac Cardiovasc Surg 1996; 44:257. 11. Shahian DM, Labib SB, Chang G. Cardiac papillary fibroelastoma. Ann Thorac Surg 1995; 59:538. 15. Edwards FH, Hale D, Cohen A, et al. Primary cardiac valve tumors. Ann Thorac Surg 1991; 52:1127. I constantly emailed this bllog post page to all my associates, because if like to read it then my friends wilkl too.